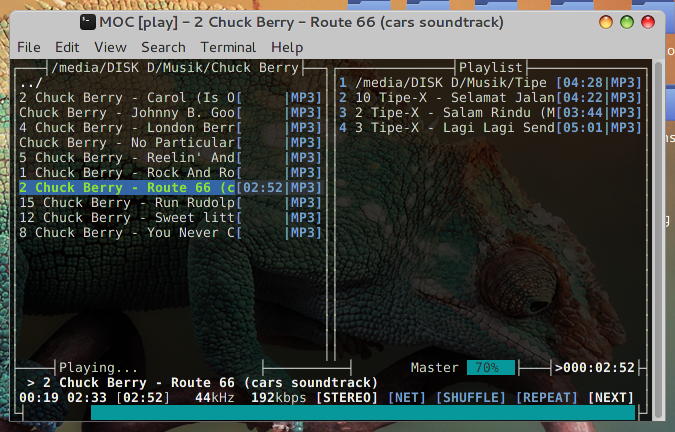 How to Listen Music from Terminal - For a long time I play music from linux console. It's very easy and simple. Music On Console is a lightweight music player which consists of 2 parts, a server (Moc) and a player/interface (Mocp). First, I really like this little CLI music program, it does everything you want, most codecs are supported, and you can use an EQ and you can set up also LastFM. I'll tell MOC from the Debian Weezy. Enjoy your favorites music! If you're looking for clean music player on Linux you can read the tutorial at Install Tomahawk, A Modern and Powerful Music Player in Linux. You can't change theme permanently without adding new config file. It means when we quit from MOCP and re-open it always back to default theme (blue). So we post a new article to handle this. You can read at How to Change MOCP Default Theme Permanently. So that's all I can write to play music from linux console. Hope help you and enjoyed reading this tutorial as much I’ve enjoyed writing it. Finally thanks for visiting Linuxslaves.